While we do offer a professional measuring and installing service, our stair lifts are designed so that the installation can be done by the homeowner. If you need help with measuring, please give us a call and one of our stair lifts experts can walk you through the process and all you need is a standard measuring tape. The stair lift uses a tracked system, which runs the entire length of the staircase and is attached to the steps. First decide which side of the staircase the stair lift will be installed. The stair lift can be installed on the same side as a banister, but the top of the track will extend about 6" from the top step, so make sure you take this into account when deciding which side the stair lift will be installed on. The track will also extend about 14" beyond the bottom step. Once you have decided where the stair lift will go, you are ready to begin measuring. Make sure you print up the form below. All of the measurements are in inches and always measure twice. The measuring tape should also remain tight, so do not let it sag between steps. 1. This is the most important measurement, because this is used to determine the length of the track. You will need to measure the distance from the top of the staircase to the floor of the bottom landing. While standing at the top of the staircase, extend the measuring tape down the stairs until it touches the bottom landing. 2. Now, measure from the top of the staircase to the edge of the bottom step. 3. Measure the width of the staircase. 4. For those who have a wall or door located at the bottom of the staircase, measure the distance from the bottom step to the wall. 5. 6. 7. 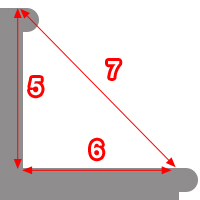 Measure the dimensions of a single step, as shown in the image. 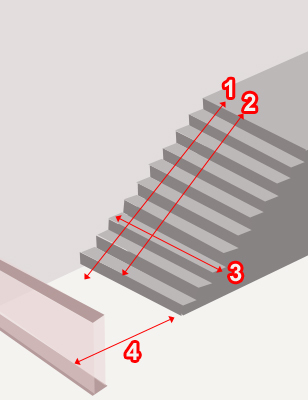 These measurements are used to configure the angle of the stair lifts seat.